With a population of less than 600 people, Sneem is a charming and beautifully maintained village that has everything going for it. Nestling between the mountains and South Kerry’s wild and rugged coast, Sneem has long been associated with a remote and relaxed way of living . 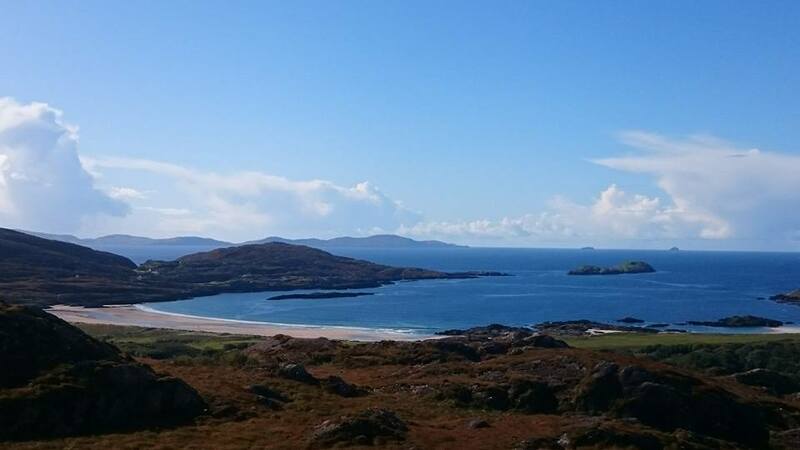 Sneem is perfectly situated on each of The Wild Atlantic Way, and The Ring of Kerry as well as The Kerry Way which is one of Ireland’s longest and most popular signposted walking trails. The village itself is famed for its colourful houses and characters and has won many Tidy Towns Awards. In 2000 a time capsule was buried in the centre of the town, to be opened in 2100. So if you start your family here they may witness the historic unveiling of what life was like at the turn of the millennium! “Sneem” derives from its Irish name “An tSnaidhm”, meaning “the knot”. Some say that this refers to Sneem being the knot in the glorious Ring of Kerry. Others think it refers to the bridge between the village’s North & South squares being a knot tying them together while more again say it refers to the knot-like swirling where the River Sneem meets the currents of Kenmare Bay in the estuary just below the village. Sneem Sculpture Trail is one of many features which that makes the village stand out. It has a collection of statues and monuments scattered throughout the village – including memorials to the late President of Ireland, Cearbhaill Ó Dalaigh (who lived & was buried in Sneem) and Charles de Gaulle (who visited for a haven of peace and tranquillity) and Sneem’s own Pyramids (aka “The Way The Fairies Went”). If you wish to trade Sneem’s peace and tranquility for a bit more of a buzz, the world renowned towns of Killarney and Kenmare are each a short yet scenic, drive away. The village has a great array of top class restaurants and pubs as well as shops, a pharmacy, post office, crèche and primary school. If you have a sweet tooth you will love the great choice of locally-produced ice-cream! The South Kerry coastline, among the most beautiful in the country with its fabulous coves and Blue Flag beach, is right on your doorstep. Living and working in Sneem affords city-dwellers and commuters the opportunity to swap stress for relaxation, traffic jams for beaches and mountains, time in the car for time with loved ones, all with more money in your pocket!